I touched on this subject in my earlier post about taking measurements and choosing which pattern size to make. It’s such a bug bear of mine that I thought it deserved a post of its own. Let’s face it, until you decided to start making your own clothes, when did you last take your measurements?! And why would you? The only way many of us tend to keep a check on our body size (if at all) is not by measuring, but by trying on clothes in shops and looking at what the size label tells us. And in every shop you go in, I’ll bet you’re a different “size”. What’s more, I’ll bet you tend to shop most in the places that tell you you’re the smallest size. Don’t fall for it, those people are playing with your mind, it’s called “vanity sizing”. Most women think they know what size they are, but all you really know is what your favourite shop is telling you that they call someone of your proportions. What this means is, if a person was exactly these body measurements she would buy one size in Reiss and Zara, have to buy one size bigger in H&M and need to buy different size tops and bottoms in Whistles, Boden and M&S, meaning dresses and coats might not fit very well in these shops. So, the biggest women’s size in All Saints is labeled L (rather than XXL) by having 2 small sizes (6 and 8) and 2 mediums (10 and 12). I’m not commenting on whether this is right or wrong, good or bad, simply pointing out an interesting fact and pondering its implications. I wonder who their clothing is aimed at? Most of the All Saints size chart corresponds with the typical measurements of teenage girls, yet prices for a simple t-shirt average around £40, their cheapest jeans are £88 and coats from £228 to over £400. Are they within a teenage girl’s budget? Interestingly this concentration on small sizes doesn’t carry through into All Saints menswear which covers a fairly typical adult male size range of 34-44” chest or XS – XXL as the men’s sizing doesn’t have two size S’s and two size M’s like the women’s sizing. Zara Not comparable but interesting as all men’s size charts refer to garment measurements not body measurements. Looks to me like fairly consistent sizing with the added bonus that in all but All Saints and Whistles, men can buy clothing with a size label that directly relates to their body measurement ie. a size 36 top in H&M for a chest measurement of 36 ¼ “ this, I would argue is a much easier way to buy clothes and is a much more honest and transparent approach to size labelling (and pattern sizing). 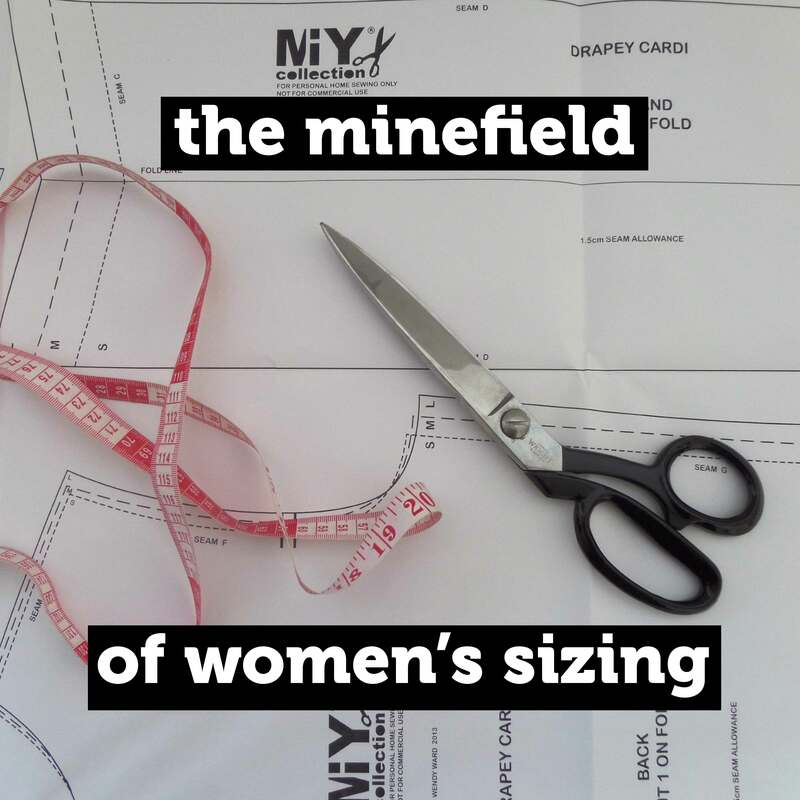 With this and my previous post in mind I will be changing all the sizing of MIY Collection patterns this year to remove any reference to dress sizes. Sizing has always been a sensitive and contentious subject which manages to draw strong opinions. I’ve been criticised myself for not including bigger sizes in my book “The Beginner’s Guide to Dressmaking” (which covers roughly dress sizes 10-18). Pattern grading (making more sizes of a pattern) is another minefield where each size that a pattern is graded adds cost to the overall development of the pattern. Add to this the fact that it’s not good practice to grade one base size up and down into lots of different sizes means that to grade well, grading needs to be restricted to grading up and down a few sizes and if you want to go bigger or smaller than that range, a new bigger/smaller pattern should be drafted to grade from, again adding yet more cost. It’s impossible to please all of the people all of the time, but I’d like to think that I’m open and transparent about how my patterns are sized and of course in future I’m hoping to be able to include a wider range of sizes. I’d love to know your thoughts on this subject? * Info correct on 17/1/15 – info taken from individual retailers’ websites. This entry was posted in Sewing Help, Sewing Patterns by Wendy, The Fashion & Craft Industries and tagged easy sewing patterns, MIY collection, sewing classes brighton, sewing pattern sizing, uk dress sizes, Wendy Ward, womens sizing. Bookmark the permalink. Interesting point on All Saints. Your approach to sizing sounds sensible, especially considering the variations you pointed out. All the best for your plans this year, website looks cracking! For indie sewing patterns, I tend to look at the designer behind the patterns as they are usually drafted to reflect their body shape- e.g. Sewaholic patterns have smaller busts and generous hips, Colette patterns have a C cup bust, Named Clothing have a smaller B cup and are a straighter shape. I hope that doesn’t mean my patterns are tree trunk shaped like me! I try to work to a very standard size chart that I’ve been using for years, but it’s tricky isn’t it, especially for more fitted styles when it comes to cup sizes, I wish I could come up some kind of magic solution to it…. Thanks for your thoughts though – it’s an interesting point. One of the reasons for sewing my own clothes is to avoid the nightmare of shopping for them and having to take three different sizes of the same garment into the changing room because you never know what measurement they are. I have often asked an assistant ” This says size 10, what bust and hip size does it fit?” A and they cannot tell me. Sample reply- “Well, it is a size 10″. Me – ” I can read that on the label but what measurement is it? Assistant- “It is size 10”. Give me a sewing pattern any day! Especially those that also give the finished measurements, as you do in your book, so you know the sort of ease in the garment. Sounds so familiar Barbara!! Not only could most high street clothing retailers source their products more ethically, they could also treat their sales staff much better and give them some basic training. I went into one shop (I won’t name) a few years ago and was looking at leather jackets – one of them was really soft leather so I looked at the label to see if it said which animal it came from, it just said “leather”. I wondered if it was calf so asked the assistant, her response left my mouth hanging open: “what, leather comes from animals?” !!!! I kid you not. Yes, absolutely, I’m always so jealous when I got shopping with/for my husband and the sizes actually correspond to his actual size! I think your sizing scheme sounds brilliant, and I am super duper excited to see all the MIY collection patterns you have in store for this year. You’re awesome! Hope I live up to your expectations! Thanks Rosie, I’m glad to hear you enjoyed the post – I think it will resonate with most women, I don’t know anyone for whom this isn’t a bug bear or a downright everyday rage inducer! I really wanted to contrast the situation we face with that of men. I think it’s yet another subtle way women are “trained” into thinking they have to fit in to someone else’s ideals. On a practical level it is difficult, although to be fair it might be easier for patterns than for ready-to-wear clothing (not needing to get buying ratios right) as long as all the sizes can be clearly fitted onto one layout……I have seen patterns with 10+ sizes all printed on top of each other and they’re not easy to use. Using measurement-based sizing for my patterns will be the first step in my attempt at moving away from these traditional sizing conventions. I totally take on board your comments about larger sizes and I’m so sorry to hear my book wasn’t suitable for you. You’re right, a lot of my designs do lend themselves to a wide range of shapes and sizes and I’m very conscious of that when coming up with new designs. 2015 is going to be a big year for MIY Collection patterns so watch this space and I hope you’ll feel better served by what I’m doing this time next year (or sooner! ).